Of all the places and spaces to which we should attend – this article names the most important. I suspect that our failure to recognize holy space in the physical surroundings of our lives contributes to our inability to find the holy place within our own heart. I am not sure which must come first – but I think we must know both. Without a proper regard for the ‘secret place of the Most High God’ and the secret place that is our own true heart – then we will know neither God nor our own selves. There aren’t many secrets anymore. I live in a city that is known as the “Secret City,” because in the Second World War it was one of the main sites of the Manhattan Project where the atom bomb, or elements of it, were developed. I have lived here for over 20 years and have come to take the name as a comonplace. But secrets are all too commonplace. During the war this city held nearly 100,000 people, most of whom had no idea what they were working on. Those who lived around the town had no idea at all. It is obvious to me that secrets can be kept. But it is also obvious to me that, for whatever reason, secrets are being kept less and less. For some, the word “secret,” is synonymous with something nefarious and evil. Things that are secret must be bad or we would let everyone know. There is another place for secrets. Psychologists would place them in the category of “boundaries.” In theology we would see them as an essential part of what it means to be a Person. It is important, it seems to me, that Scripture uses the phrase “Secret Place” to describe the most intimate of places where we can be with God. It is secret because I cannot share it, I cannot find words to speak of it. I am in it only because I was invited and once there (having removed my shoes) I am on holy ground and the “secret” is nothing evil, but the very Good Himself. What do I do with the Secret? When I stand in the Secret Place of the Most High, I can worship. Anything less would be sacrilege. I can adore the Most High God, even if I can find no words to give voice to my praise. Every human being has a “secret place” – that within them that is most intimate – that is beyond words – that is made for God. Learning to enter this place is a very difficult thing and only comes with time and practice. Our culture, the world where the most secret things in our lives are shouted from the rooftops, tells us to profane even our secrets and shout them to the world as well. And thus we lose something at the very core of our Personhood. Violated, every man and woman becomes a harlot. It is also learning to recover our hearts, our secret place. The priest will never speak of it (on pain of being deposed). Indeed, it is normally understood that the penitent should not speak to others of what he or she has said in confession. Unless there is forgiveness of others that needs to be sought, all is done. There is much in Orthodox worship and life that seeks to teach humanity of the Secret Place of the Most High and of the secret place that lies within our own heart. The lack of such knowledge robs us of our ability to worship God, of our ability to fully understand our own Personhood, of our ability to love others rightly, and of our right mind. Only a crazy world would destroy the secret places. Without them, we become human beings who have no center. Violated by the presence of others where we should be alone, we become mad with the madness of Legion. Many visit, as I have noted, in an Orthodox Church and are offended at its practice of secret things, of the hiddeness of God. Some draw back at doors and curtains, others draw back at the exclusivity of the altar. I am asked, “Why can only men be priests?” And I respond, “It is not ‘only men’ who can priests, but only a few men.” Some few are set aside to stand in that most Secret Place and offer the Holy Oblation. Democracy and equality stop at its doors because before God no one is justified, no one is worthy, no one may make a claim. We come only as we are bidden. And those who have been bidden to stand in that place at the altar and to hold in their hand the Most Holy Body of our Lord, God and Savior, do so with trembling if they do so rightly. For they stand in the Secret Place of the Most High God. The most profound moment in all of the Liturgy (if I dare say such a thing) occurs as the curtains are opened along with the doors and the Deacon cries out: “In the fear of God and with faith and love draw near!” And the faithful come forward to receive the Body and Blood of God. That which is Most Holy, which lies in the Most Secret Place, is now brought forward as a gift to the believer who receives in joy, in faith, in repentance, and in a renewed knowledge of the God Who dwells in the Secret Place, and Who now enters into our most secret place. I will offer a short exhortation: if you keep a website or a blog, do not make it a place for your secrets or the secrets of others (as is too often done in both cases). There is no virtue in this, but only sin. Bring your secrets to God and stand next to His priest. There you will find love and respect, not judgment. And you will find a balm for your soul. This most public of all places (the internet) hates your secrets and would only use them to destroy you. Learn to be silent and speak to God in your heart. I offer this begging…if you have posted your secrets – remove them! Close the doors, draw the curtain and stand in secret before the Most High God! This entry was posted on January 20, 2010 at 2:06 am and is filed under Orthodox Christianity. You can follow any responses to this entry through the RSS 2.0 feed. You can leave a response, or trackback from your own site. Thank you Father for this post. I read one of your posts a while ago, this is my second. I appreciate your comments and as one who is new to Orthodoxy it is a message I am discovering is true. What a blessing to move from Protestantism (one of the most liberal) to the One True Faith. We need to, as you say, dwell with God in the secret place of our hearts. And only through repentance, standing beside our spiritual Father as witness to confess does our heart become a place we would want to occupy. I sense I am not explaining it well. Four posts in one day. Are you OK? Doubtless in need of prayer. I appreciate especially that last comment. On one hand there is a desire to live blamelessly, such that you have no fear of anyone revealing things about you, but yet I see that there is a secret place which is not hidden because of shame but because of holiness. Is it the secret places – unaccounted and undocumented – where man has his freedom? I would hope that we have freedom in all things and places. The notion of freedom as to “do what I want” is not freedom according to the Fathers. Freedom is to live fully in accordance with my nature (particularly as articulated in the theology of St. Maximus the Confessor, and thus the 5th and 6th Councils). This is true freedom. Thanks for this post, Father; it’s got me thinking about something I never really considered before. Orthodoxy (at least, the little I know about it!) has always placed a great emphasis on community and interrelationship; and yet it also values the secret places, both geographically and spiritually. By contrast, some of the strands of Christianity which seem most led by the spirit of the internet age (televangelists, public testimony, great outpourings of emotion, and so on) are also the ones which seem to have privatised faith (it’s all about me and Jesus, and my own personal salvation or condemnation). You said something a couple of months back that I am still mulling over (or, to be honest, still struggling to understand): that it is only really possible for someone to be a hermit if they are properly grounded in their community. I might be totally wrong, but it seems that what you are saying here is connected to that, in some way that I can’t quite understand or articulate. Could you say a bit more on how the relationship between the ‘secret’ and koinonia could/should/does work, please? The Orthodox Faith is comprised of Secrets, as Fr. Stephen writes, and this is a stark, puzzling contrast to contemporary Chrisitanity. 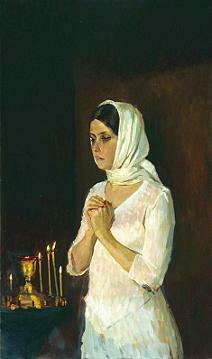 Orthodox Christians have a long tradition as a quiet, reverent Faith. How loud can you be about a private, personal relationship with God? Yes. I would think so. Boundaries (created by secret or private places) make freedom safe. I am also glad to see that you have used Andrei D’s painting. I use that as my personal avatar – she is beautiful and elegant, isnt she? I must thank you again for your wisdom. I dare say I am nourished every time I read your blog. I know your wisdom comes from God. I appreciate your exhortation to bloggers. People don’t like secrets, neither do most of us like to live in obscurity. Both can be spiritual disciplines. You mean of your’s or of others’? You have mine in any case (and i’m sure of many others’ too) – beautiful postings too. …question on the documentary: “A Pilgrim’s Way”; any information on when it will be available? Unfortunately, I’ve heard nothing as of yet. Yannis, both. And I thank you for yours and for those of everyone. Yes, but power for what? Existential power to change from being an “animal” that lives only for itself (or for a few significant others) to an animal that worships the living eternal God, and finding its true centre becomes fully human, as the Creator intended. A Eucharistic animal, in other words. I so love your posts, and this was beautiful. The secret is something we all need to sense and love more fully….. However, I do have one concern. In respect to the concern that women may not be priests, the response that few man may be dies not answer. “Few”is not “none”. Nor –except for the Greek dispensation, and there only within the confines of a monastery–are thay ordained as deacons/deaconesses, though that tradition does exist within the earlier days. What, then, can we say to a woman who experiences a sense of calling and gifts which, if she were a man, would make her a possible candidate for ordination? Why are only women hidden so completely? Where is the place for such a person in the liturgical and pastoral life of the church? Until some palce is found, such as the role of deaconess, there is a lack in the fullnes of our liturgical and corporate life. Christ is the only fullness. Anyone (I speak from personal experience) who looks for fullness or fulfillment anywhere else, including in their “ministry,” will fall into delusion, even deep delusion. “Vocation,” is to a large extent not a proper question within Orthodoxy. I do not think of myself as being a priest because I was called. It’s not my priesthood anyway. A priest is chosen (ultimately) by the community of the Church and set aside to bear the weight of the priesthood. In early days men were known to run away to avoid ordination. Today, people complain that not being given this yoke of obedience is keeping them from being fulfilled. Something has changed – but not the priesthood. If one finds themselves wrestling much with the desire to stand at the altar (etc. ), they should seek not to dwell on it. It’s a temptation. Our modern world has a great deal of confusion about things like “vocation.” I’m not surprised it touches many within the Church, and has led many priests into confusion. We would all do better to have run away. In the ordination service in the Orthodox Church, deacons ritually “drag” a man to his ordination. The people respond “Axios” (“he is worthy”) at the conclusion of the ordination. Axios was the ancient cry of the crowd in the act of electing someone to an office. It is frequently the case within Orthodox practice that an ordinand does not know of his impending ordination until a week or even a few days before the event. This is in great contrast to many ordinations in the West where invitations and the like are sent out, ordinands help “plan” the service, all as if it were a modern Romantic wedding. Frankly all of that distorts weddings – and it distorts ordination and priesthood. As for the ministry of deaconess, I remain unconvinced that there is clarity about what the precise nature of that ministry was in the early Church. Though, I am sure if the need for it arises again, we will see it again. We don’t have “doorkeeper” ministries either, but I have not seen major works and articles advocating that until we restore the ministry of doorkeeper, people will not be fulfilled or know the fullness of Christ. Priesthood is a terrible burden and full of temptations and dangers. Except for the mercy of God it would destroy everyone who is ordained. Pray for priests, never envy them. I am a little bit confused why not to keep a blog to write some ideas, is it so dangerous? shouldn t we inform the other people about the big social problems which are going to come? if you have time please take a look on my site http://www.orthodoxcollection.blogspot.com and tell me your remarks. I went to your blog but do not read modern Greek. Sorry. The Scriptures say, “A word spoken in due season, is very good!” (Proverbs 15:23). Perhaps everything you have posted is good. But it is not always good to post everything. Words (a Godly word) is a good thing when it is God speaking in us. In that, it also has timing and purpose and things known only to God. To offer warnings and opinions simply because you can is not always a good thing or a thing blessed of God. Thus, my suggestion that there is such a thing as a secret place and that many would do well to learn more about it. Thank you Father for this post and for so much of your writing! I have been thinking a fair bit about this turned inside out tendancy, to expose what should be kept secret and to become hardened inside. What I know in myself, and also see in others is that this “secret place” is also where we need to be known in the deepest way. If we do not meet God, then we desperately seek out some sort of meeting, of knowing, causing this madness you describe so well. Is there any way to help those who are so turned inside out, but yet are not open to the church? I have several very needy friends who are not open to the church, but who are constantly hurting themselves or getting hurt because their need to know and be known is so intense. How can I help?